Hanoi will create optimal conditions for the licensing and construction of a new research and development (R&D) centre of Samsung Vietnam, Chairman of the municipal People’s Committee Nguyen Duc Chung has said. 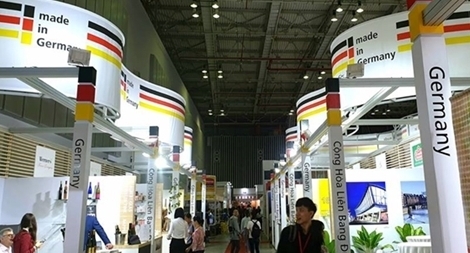 PSNews - Thanh Thanh Dat medium density fiberboard (MDF) factory was inaugurated on April 21 in Vu Quang District, Ha Tinh Province with the presence of Deputy Prime Minister Vuong Dinh Hue. The province has around 1,215 wood processing businesses, with 905 of them domestic firms with VND10.8 trillion (US$469.6 million) of registered funds, and 310 foreign companies with a total of US$2.3 billion, according to Binh Duong’s Department of Industry and Trade. PSNews - The Vietnam Software and IT Services Association (VINASA) on organized a ceremony on April 21 to honor the winners of Sao Khue Awards 2019. PSNews - The Military Industry-Telecoms Group (Viettel) held an awarding ceremony, entitled “Viettel’s Stars,” to honor its eight individuals and eight groups, with significant contributions to the group’s development last year.